Built in 1855, Seven Foot Knoll was one of the first projects to enjoy the full benefits of prefabricated parts. This allowed pieces like walls and beams to be transported out to the site and quickly assembled. The Baltimore iron foundry Murray and Hazelhurst undertook the fabrication of the original structure and pilings. The first cast-iron cottage was brown and octagonal in shape, with green, iron window shutters but was replaced around 1875 with a round dwelling unit composed of wrought-iron plates. This circular upgrade consists of a first level forty feet in diameter, standing eight feet above an octagonal service platform. A gallery deck, originally covered by a veranda, encircles the first level and is bordered by an iron balustrade and handrail. 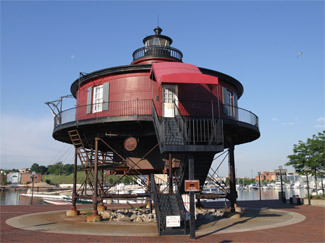 Centered over the first floor is a 15-foot diameter watchroom that is in turn topped by a lantern room with a nine-foot-wide deck. 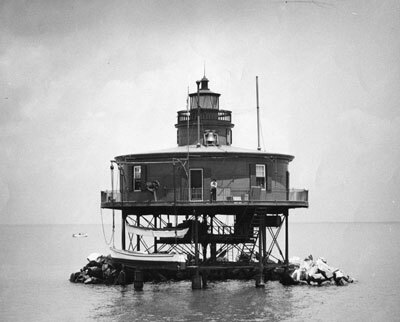 The lantern room has a unique design feature of twelve storm panels in the shape of truncated triangles and was home to a fourth-order Fresnel lens visible for 12 miles. Seven Foot Knoll was not always a lonely post for a single light keeper; over its 133 years of manned operation many families made their homes there. In 1936 Eva Marie Bowling, the daughter of keeper James T. Bowling who served from 1872 to 1879, recalled her early life at Seven Foot Knoll Station for a local newspaper. Eva Marie was born at the lighthouse on June 23, 1875 and was nicknamed Knollie after her birthplace. “There are five large rooms,” she related, “and we had a piano and big bookcase with no end of books which occupied our time during the long winter evenings. Mother had been a school teacher and she taught us, because we had no way to get to and from the shore for school.” Ms. Bowling went on to note some of the many chores and duties at the station that contributed to her family’s survival: “We had nets and lines and an abundance of seafood, which we traded with the farmers for vegetables.” A hog pen and chicken yard were located on the platform below the living area to further supplement the family’s diet. Strong storms occasionally swept away this makeshift barnyard, but the livestock was always rescued beforehand and temporarily housed with the family. One day a storm delayed Keeper Bowling’s return to the lighthouse, forcing his wife to take over the lightkeeper duties and arduously ring the fog bell by hand the whole night through. Different memories of a keeper’s life at Seven Foot Knoll Lighthouse were shared by the family of Thomas Steinhise, the final civilian keeper. Steinhise’s family did not live at the station with him, but rather saw him eight days out of the month during his shore leave. Steinhise shared his duties with another keeper, and each man spent eight days entirely alone at the light while his partner was ashore. According to Steinhise, a good keeper required a multitude of skills including painting, carpentry, navigation and cooking. In 1933 Steinhise accomplished the rarest but most important of the keeper’s tasks, a rescue at sea. Shortly after midnight on a violently stormy night, Steinhise heard a distress whistle. Taking the station’s small motorboat to investigate, the keeper braved fifteen-foot waves and 90 mile per hour winds. Coming upon the five stranded crewmembers of the sinking tugboat Point Breeze, Steinhise was able to rescue them and transport them to safety. Steinhise’s granddaughter Bernadette reported that the engine in her father’s launch was “faulty,” which really made him a deserving recipient of the Congressional Medal for Heroism that he later received. The days of a keeper at Seven Foot Knoll Lighthouse ended in 1948, when the light was automated. This was welcome news for captain of the port George E. McCabe. In an interview with The Baltimore Sun, he pointed out that “keepers are hard to get. Young people no longer want to live in lighthouses. And the oldtimers, who have been at it for years, are disappearing one by one.” McCabe related how even Coast Guardsmen eschewed lighthouse duty, pretending to be sick or plagued by boat trouble. The neglected Seven Foot Knoll Lighthouse was replaced by a simple steel skeleton tower in the late 1980’s and declared surplus property. It may have faced demolition had not the City of Baltimore obtained its title. The city contracted with Empire Construction to move the lighthouse to its Pier 5 as part of a redevelopment plan for the harbor. In October of 1988, amidst churning river waters and gusty winds, the move was undertaken. It took some time to sever the lighthouse from its iron pilings, as the torches held by cold-weather divers were continually extinguished by the wind and spray. Finally, the 200-ton lighthouse was lifted from its foundation by “The Samson,” a massive derrick, and barged up the Patapsco River to its new home in Baltimore’s Inner Harbor. The lighthouse placed ashore in Baltimore's Inner Harbor where it was donated to the city. On August 22, 1989 the lighthouse was listed on the National Register of Historic Places. Aided by the Lady Maryland Foundation, many members of the Steinhice family descendants worked to restore the structure prior to its re-opening. The move cost $600,000, and additional funds were expended for the lighthouse’s restoration, which took about a year and was aided by descendants of Keeper Steinhise.